Boston politicians are ignoring our real transportation needs — at the peril of the whole region. 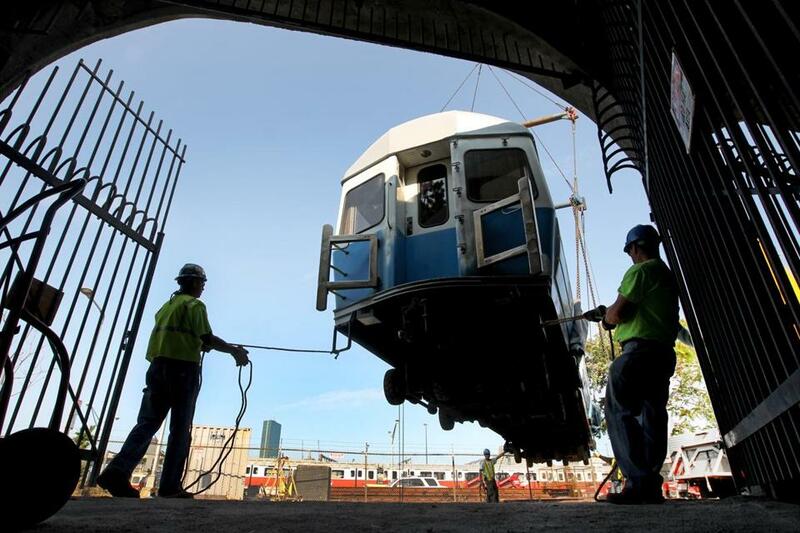 MBTA workers move a retired Blue Line subway car in 2012. FEW THINGS ARE MORE CRUCIAL to the vitality of Greater Boston than transportation. How much the Commonwealth spends on the area’s subway cars, buses, rail links, and other infrastructure in coming years will help determine how livable the city is, how fast its economy grows, and even the cost of housing. So it’s more than a little disappointing that Boston’s elected officials have been mostly silent during the crucial debate on the fate of transportation as it has been unfolding on Beacon Hill. In the first three months of this year, Governor Deval Patrick canvassed the state promoting transportation’s need for an additional $1 billion in tax revenue over 10 years, much of it coming from proposals like gas and cigarette hikes. The Massachusetts House of Representatives countered by passing a $500 million package that does little beyond fixing structural debt problems. The Senate upped the figure to $800 million, mostly from sources other than increased taxes, but that still wouldn’t be enough. The corporate expansion pulling Massachusetts out of the recession is largely taking place in Boston and Cambridge, but it depends on the ability to move workers into and around the city efficiently. As any MBTA commuter can attest, that barely happens now. It will be a total fiasco without at least a couple of billion dollars — that’s right, a couple of billion, according to a Transportation Finance Commission report — to replace outdated subway cars, buses, and electrical systems. Without that money, workers and residents won’t be able to get where they need to go reliably, even as fares will most likely sharply increase — by as much as 30 percent, an MBTA director warned. And all of that will send more people into their cars, further stressing the roads and bridges with needed repairs that are also at risk. Reasonable people can, and do, favor different approaches to the problem of what projects to fund and how to pay for them. Regardless, Bostonians should be outraged that these crucial decisions are being made almost entirely by politicians from other parts of the state, whose constituents may not have our city’s best interests at heart — and who often don’t understand how relatively high levels of investment in Boston benefit the entire state. There are exceptions within the Boston delegation. State Senator Sonia Chang-Diaz, notably, has been among the most vocal advocates inside the State House for more MBTA spending. Mayor Tom Menino has issued vague statements in support of transportation spending but appears to expend little political capital lobbying for it. Boston city councilors, after passing a resolution asking the state for investments, have been quiet since actual proposals appeared. Most of Boston’s state senators and representatives have held their tongues and allowed legislative leaders to dictate their votes. None of Boston’s 16 representatives stood up against House Speaker Robert DeLeo’s $500 million proposal; the only nay voter among them, Nick Collins of conservative South Boston, objected to raising even that limited amount of revenue. Some of the silence is a matter of timing, of course. Menino, largely sidelined by poor health and his decision to retire, is now dealing with the aftermath of the Marathon disaster, like many other state and local leaders. Meanwhile, two important Boston seats are vacant, due to the recent resignations of Senator Jack Hart of South Boston and Representative Marty Walz of Back Bay. And I don’t think it helps that many of the city’s elected officials seem to be running for some higher office, which has them nervous about taking any controversial stands. There’s no doubt Boston’s lawmakers have lost a great amount of influence in the Legislature. When the speaker, Senate president, and four influential committee chairs held a press conference to announce the $500 million bill, none of the six represented Boston. If city leaders don’t eventually step up in a meaningful way, Boston could end up stalled for years to come. David S. Bernstein, a former political reporter for the Boston Phoenix, is a freelance writer. Send comments to magazine@globe.com.